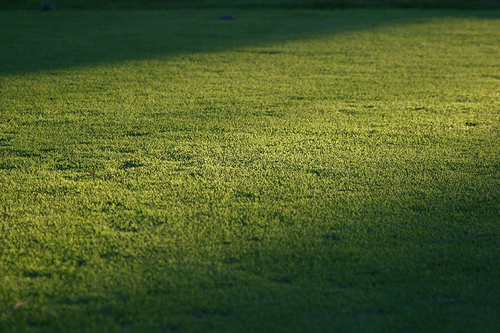 Sports Costs > How Much Does a Home Putting Green Cost? How Much Does a Home Putting Green Cost? A home putting green is an area that simulates the putting green found on a golf course. These putting greens are often installed in the backyard and could be made using the same materials as an actual golf course or could even be installed inside the home using synthetic materials made to simulate the look and feel of a real golf course. When it comes to a home putting green, you are going to have two different options: a pre-made putting green that comes right out of the box or a green that can is customized and then installed in your own backyard. For a putting green that comes straight out of the box, the prices can range anywhere from as little as $40 to as much as much as $2,000. The typical cheaper putting greens that are less than $200 are ideal for a small room or office. These greens are usually straightaways with a slight slope and a few holes near the end. For instance, the Grassroots Par Three Putting Green that measures 3×9 feet retails for $40 to $55. Professional greens that have to be installed can cost anywhere from $1,900 to as much as $4,000. This is going to be an estimate without any installation charges. For instance, this 14’x14′ putting green retails for $2,500 without installation. For custom jobs, most contractors will charge by the square foot. For example, SuperiorGolfGreens.com, a professional contractor we found online, charges $3 to $6 per square foot. On average, plan on spending at least $4 to $15 per square foot for a long-lasting green. These costs will depend on the size of the green, where you live, the amount of base required, the complexity of the design and the contractor you choose. With the average putting green at a home inside the 400 to 500 square foot range, you should be prepared to spend $1,600 to more than $7,500 for a solid putting green that looks similar to one found at a local golf course. However, this could be much more if you were to add accessories or expand the size of it. The Landscaping Network says you the average cost could be $14 per square foot. Most home putting greens are going to be made of a synthetic grass, the same grass that is used by the PGA pros; however, some people, while rare, will choose to use a real grass such as bent grass or Bermuda grass. For customized putting greens, the average size found in most backyards is around 500 to 700 square feet; however, the sky is the limit. Putting greens will be installed with a sand fill to help carry the ball as it travels. Also, the green will be designed on a specific slope so the water can easily drain. Too much water buildup, if it can’t drain, can damage the putting green over time. A good company will always include a warranty that can last up to eight to 12 years. Most putting greens will come with multiple holes. This allows the golfer to practice many different situations, obstacles, and distances, for example. Experts recommend that you purchase maintenance materials such as a rake, broom and green roller. Every 12 to 18 months, the artificial turf should be rolled to ensure a smooth putt. Depending on the situation, necessary adjustments may need to be made as well. Even though experts don’t recommend it, some people are insistent on installing a putting green with real grass. If your putting green were made from real grass, then you would need to factor in the annual maintenance. This would include the mowing, fertilizing, insecticide, water to maintain and reseeding if necessary. Additional features, often added by those who install a putting green, may include a bunker, fringe or even customized flagsticks and flags. Taking care of a putting green outside is not necessarily hard to do. All you have to consider is sweeping and keeping it free from debris. While it is not necessary, some opt to cover the green during bad weather. The installers should be able to give you tips for the care of the putting green. Thoughtfully consider whether or not you will use the putting green enough to make it worth the cost. Depending on where you live, there may or may not be a variety of professional putting green installers. Regardless of how many companies are in the area, always try your best to contact at least three companies to see what they will charge. Most will be more than happy to provide a quote for free. To get these quotes, consider using HomeAdvisor.com to have reputable and licensed contractors contact you with a quote. If you purchase a cheaper putting green, you could consider the installation yourself.